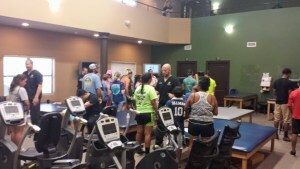 First Choice Physical Therapy: Free School Physicals, Big Success! Free School Physicals, Big Success! We love it when a plan comes together. We love it even more when the community supports the plan. Kids that participate in sports in the Bay County school system must have a physical each year both they can join in. For the 3rd year First Choice Physical Therapy hosted a morning of free school athlete physicals for the students. It is a team effort that extends beyond the staff at FCPT though. We send out a big “Thank You” to everyone involved. Doctors from around the county volunteered to do the main exam and many FCPT staff making sure that students had filled out their forms before getting in line to have their physical and manning several stations set up to check weight, height, eyes and more. It ran like a well oiled machine and you would think we do this everyday. While this was open to all Bay County students Bay Haven and Bay Haven North were the largest group taking advantage of the offer. It is a testament to the communication system in place between the school, the students and the parents. They really no how to get the word out! If you missed it this year you can go ahead and put it on your calendar to start watching for us to announce the date next year. We like to target the last weekend of July or very close to it. Follow us on Facebook or visit our web site to find the exact date when it is announced.